One of the things you get to do while driving long distances is think about what you said in your posting and what you wish you had said. I’ve done a lot of that. As of right now, I’m close to 8000 miles since July 5. I’m in Whitehorse, Yukon at noon and I’m headed for Wood Bison National Park in hopes of getting some bison shots. That won’t happen for probably two days though. Anyway, back to thinking about what you’d liked to have said after you’ve posted. When I got up on Saturday morning at 5:15am and saw Mt. McKinley, it was AMAZING. It’s hard to adequately show the immense dominance of the mountain. Pictures don’t do it justice. I’ve visited several photo galleries in Alaska and many have great shots of the mountain but none of them capture its magnitude. As a reminder, here are two shots I’ve previously posted. When I saw the mountain on Saturday morning, you had the feeling you could reach out and touch it or certainly drive a mile or two and be there. Actually, the first shot…sunrise….is 27 miles away. That’s as close as you can drive to it. The second shot is from the Eielson Visitor Center is 33 miles away. I’ve been trying to come up with an analogy to explain how big it is. For example, we’ve all probably seen pictures of the World Trade Center towers prior to 9/11 taken from the New Jersey shore and how they dominated the skyline of lower Manhattan. I believe the World Trade Center was 110 stories at 11’ per story that puts its height at about 1200 ft. That would make Mt. McKinley about 15 times taller and it would cover virtually all of NYC. Imagine how that would look from the Jersey shore. 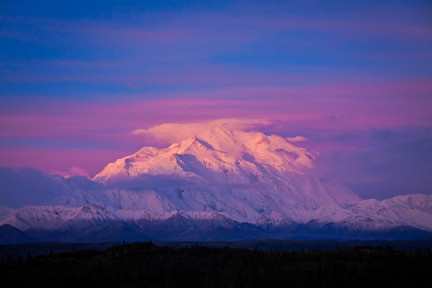 The mountains around McKinley are between 4-10,000 feet. 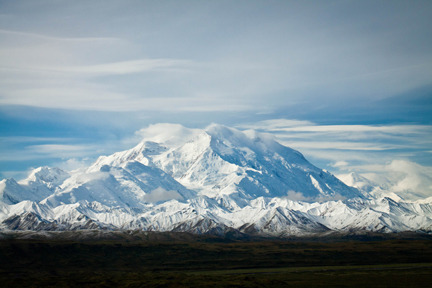 A couple are 12,000 and 16,000 ft. That means the majority are half the size of McKinley. Another analogy is to imagine a group of 4-6-year-old kids standing on stage in front of a curtain. Now imagine the curtain opening and a lineman for a NFL team in football gear steps between them. He’s going to be twice as big as some of those kids and a third again as big as some of the older ones. That’s the dominance of Mt. McKinley. Pike’s Peak in Colorado is about 14,000 feet. McKinley is a MILE Plus taller. That’s it for today. I’m going to check my guide to see what I do around Whitehorse or if I move on. I want to spend a couple of days around Jasper National Park, Lake Louise and Banff in Alberta before meeting Jean in Great Falls, MT on Saturday, August 20. I appreciate everyone’s comments and notices when the posting doesn’t go exactly as planned. My son, Derek, is usually first with “Dad, it took me to the last post” or “Dad, it cut off your post”. Now, I try to check for those things before I send out my notification. Something I should have done anyway. Also, it’s never too late to add someone to this blog. If you know someone that would enjoy reading it and/or seeing the pictures don’t hesitate in forwarding the link to them or send me an email at rgates002@gmail.com and I’ll add them to the mailing. They can always go back to any of the earlier posts. Thanks again until next time….